Our sister Province of Cheshire made a foray over the border from the deep south to help lift the spirits of those using the Warrington General Hospital Accident and Emergency Department. 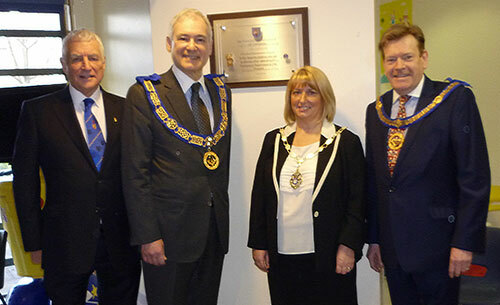 Their visit was made to unveil a plaque to mark the 14th year of their support to the paediatric unit by Cheshire Masons through the Teddies for Loving Care Appeal (TLC). During this time over 6,000 teddies have been sent to the unit to help relieve the stress and anxiety of the young children who were receiving care. Teddies for Loving Care began in Cheshire in 2004. The Provincial Grand Master for Cheshire Stephen Blank was joined on his visit by West Lancashire Assistant Provincial Grand Master Kevin Poynton at the unveiling ceremony, along with Rob Oliver who co-ordinates the TLC initiative in the Chorley and South Fylde Groups in our Province. The Masonic party was also delighted to be joined by the Deputy Mayor of Warrington, Councillor Karen Mundry who is no stranger to the good works that Freemasons do and once again she thanked them for their continued efforts. Stephen also commented that Warrington was one of the many hospitals to receive the teddies, which not only helped young children through the stress of being in a strange place but also were also found to have beneficial and calming effects on some older patients, especially those suffering from dementia who had been admitted to A&E. Kevin additionally took the opportunity of thanking the management and staff of the A&E department for their dedication and commitment to the welfare of all who enter their unit.